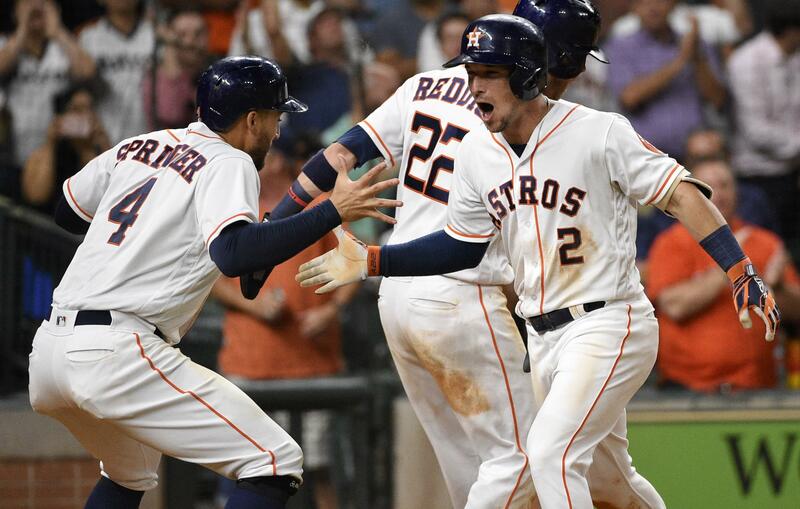 UPDATED: Mon., Aug. 27, 2018, 10:57 p.m.
Alex Bregman and Tyler White homered and drove in four runs each, and the Houston Astros rallied for an 11-4 win over the Oakland Athletics on Monday night in Houston. It was the sixth straight win for the first-place Astros, who moved to 2 1/2 games ahead of Oakland in the A.L. West standings. George Springer and Jose Altuve helped in the victory, driving in a run each during a five-run third inning that erased an early 4-0 deficit. This was the first game Springer, Altuve and Carlos Correa were in the lineup together since June 25. Springer, who pinch-hit Sunday, missed the previous five games with a quadriceps injury. The Astros led by 1 with two on and one out in the eighth inning when Bregman, who tied a career high with four hits, sent a pitch from Lou Trivino just over the short fence in left field to push the lead to 8-4. White made it 11-4 with two outs in the inning when he launched a fastball from Emilio Pagan onto the train tracks atop left field for another three-run shot. The Athletics jumped on starter Gerrit Cole (12-5) for four runs behind a two-run homer by Marcus Semien in the second and a two-run run shot by Matt Chapman in the third. The homer by Chapman was his 21st after he homered twice Sunday. Orioles 7, Blue Jays 0: In Baltimore, Kendrys Morales had his home run streak snapped at seven games by the Baltimore Orioles, who ended an eight-game skid by defeating Toronto. Striving to tie the major league record of homering in eight straight games, Morales went 0 for 3 with a walk and did not hit the ball out of the infield. In his final chance, the Toronto slugger swung through a slider from Paul Fry to strike out in the eighth inning. Though he failed to match the mark shared by Dale Long, Don Mattingly and Ken Griffey Jr., Morales owns the big league record for successive games with a home run by a switch-hitter. He also owns the franchise record for consecutive games with a long ball. Facing Baltimore rookie David Hess, against whom he homered last week, Morales struck out in the first inning, grounded out in the fourth and drew a four-pitch walk in the sixth. Hess (3-8) tossed six innings of four-hit ball to earn his first win since May 25. He was 0-7 in his previous 12 starts, though he did pitch very well against Toronto his last time out. White Sox 6, Yankees 2: In New York, Carlos Rodon pitched two-hit ball over seven innings, Yoan Moncada doubled in two and surging Chicago beat the Yankees for its fourth straight win. Rodon (6-3) allowed a two-run homer to Gleyber Torres but was strong otherwise, and Chicago’s bullpen closed out a three-hitter. The White Sox have won 10 of 13 and clinched their first winning month of the season by improving to 15-10 in August. Rodon is 5-0 with a 1.84 ERA in his past nine starts. The 25-year-old left-hander hasn’t lost since June 30. New York (83-48) missed an opportunity to gain ground on the idle Red Sox, falling 6 1/2 games back of the A.L. East leaders. Nationals 5, Phillies 3: In Philadelphia, Stephen Strasburg threw six effective innings, Matt Wieters hit a solo homer and Washington beat Philadelphia. Strasburg (7-7) gave up two runs and five hits, striking out five. The Phillies fell 3 1/2 games behind first-place Atlanta in the N.L. East after losing the opener for the seventh straight series. They’re 6-12 since Aug. 8 and have dropped five games in the standings during that span. Zach Eflin (9-5) allowed five runs – three earned – and eight hits in 5 1/3 innings. His throwing error in the fourth cost him. Cubs 7, Mets 4: In Chicago, Jon Lester pitched six innings, drove in two runs with a timely single off Noah Syndergaard and made two nice plays in the field, helping Chicago beat New York for its sixth consecutive victory. Anthony Rizzo homered and Daniel Murphy reached three more times from the leadoff spot as N.L.-leading Chicago moved a season-high 24 games over .500 by improving to 5-0 against New York this year. Murphy, who began his career with the Mets, is batting .407 (11 for 27) in six games since he was acquired in a trade with Washington. Lester was in line for his 15th win before Kevin Plawecki hit a solo homer off Steve Cishek (4-1) in the seventh, tying it at 4 on a warm and windy night at Wrigley Field. But the Cubs went ahead to stay with two runs in the bottom half, including Ben Zobrist’s tiebreaking double off Jerry Blevins (1-2). Michael Conforto also homered for New York, which had won four of six. Noah Syndergaard allowed four runs and nine hits, struck out six and walked three in six innings. Giants 2, Diamondbacks 0: In San Francisco, Chris Stratton threw a career-high eight innings to outpitch Patrick Corbin, and San Francisco blanked Arizona. Steven Duggar’s second home run of the season – a two-run shot – helped the Giants gain ground on the N.L. West-leading Diamondbacks. San Francisco pulled within seven games of first place and 7 1/2 of the second wild card. Arizona’s lead dropped to a half-game over the idle Los Angeles Dodgers. Stratton and Corbin had nearly identical outings, the difference being Duggar’s homer off Corbin in the second. Stratton (9-7) struck out six, allowed only two runners past first base and retired the 17 of the final 18 batters he faced to win for the first time since June 17. Angels 10, Rockies 7: In Anaheim, California, Eric Young Jr. had a go-ahead two-run single during Los Angeles’ five-run eighth inning and the Angels rallied to beat Colorado. DJ LeMahieu belted a grand slam in the top of the eighth inning to give the Rockies a 7-5 lead. Mike Trout belted his 31st home run of the season for the Angels, while rookie Shohei Ohtani swatted his 15th. Published: Aug. 27, 2018, 10:22 p.m. Updated: Aug. 27, 2018, 10:57 p.m.